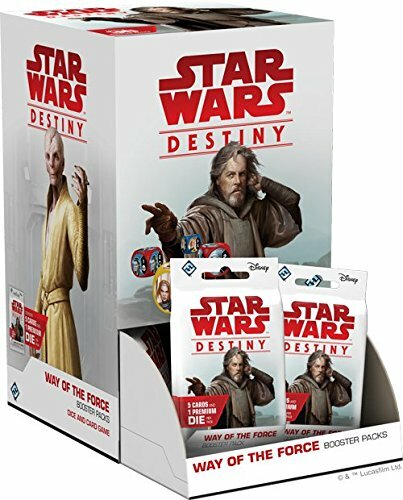 Dean's Favorite Spoiled Destiny cards from the Way of the Force Expansion — GamingWithSwag.com - Dads By Day, Gamers By Night. Star Wars Destiny has a new set coming out in about two weeks and the spoilers for cards have been rolling in for the "Way of the Force" expansion. The game had really grown with the last few sets to have a healthy draft system and some variety to competitive decks that can be used. With the new set we hope the variety gets stronger and things look good so far, but here are my top three spoiled cards. 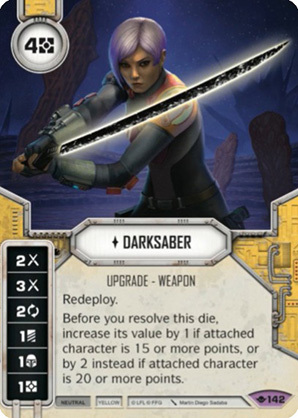 The game has really punished expensive characters not named Sabine, and while this Darksaber card might not be enough on its own, this is a great way to make those characters more viable. It is expensive but it does sick amounts of damage, has redeploy, and is neutral to go in both hero and villain decks. However, the versatility of this card on top of it being legendary rarity might mean this card is hella expensive. Although historically, 4 cost upgrades have not been the most sought after and maybe this will be more reasonable to acquire and use in your dusty K-2SO or Mace Windu deck. Plo Koon is made to pair with two non-uniques like two Padawans for a cheap upgrade team or two Jedha Partisans for a mill team. He will center a bunch of viable decks and will be an early favorite who isn't super rare like how Aayla was for the last set. Lastly I have chosen the upgrade "Way of the Force" which doesn't come with a die but may really open up new pairings by making non-uniques elite or gambling on a single die version of a character that you hope to upgrade back to elite to cheat the point system. I plan on playing with this one quite a bit. However, my immediate thought it that pairing it with Plo Koon will be immediately scary. Let me know if you have another favorite and on July 7th we can start to unleash them on one another.